19th Century Romanian Wagon For Sale! A couple days ago I stopped by a neat warehouse in downtown Baltimore called Second Chance. The motto of the place is “Retrain, Reclaim, Renew!” Essentially the idea is to deconstruct buildings instead of demolishing them. This saves materials, valuable resources, and money. After deconstructing a building Second Chance takes building materials as well as furniture, cabinets, sinks, toilets, vanities, counter-tops, statues, mirrors, etc. and sells them in this warehouse. If you need to buy building material or need a hard to-find part, say a doorknob or handle, Second Chance most likely has it. There is a lot of really cool and interesting things that Second Chance carries in it's 200,000 sq. foot warehouse. However, the most interesting item that this Auto Journalist and Blogger found there was a 4-wheeled vehicle, of course. 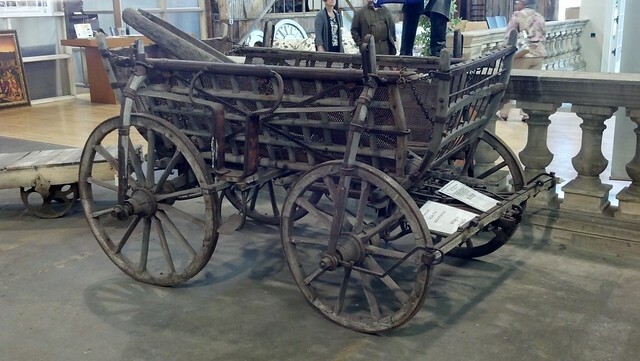 That was the above pictured 19th Century Romanian Wagon that was up for sale. For a cool $4,500 you could take it home. Unfortunately I don't have that kind of money or space to store a wagon, but if you do I recommend going down to Second Chance to check it out! The wagon is representative of Second Chance as a whole in my opinion. Just because something is old, worn, or isn't cutting edge technology doesn't mean it doesn't have value or can't be used by someone. However, I am glad I didn't have to use the wagon to get to and from Second Chance. For more pictures of the wagon check out my Flickr Photo Set. Posted on Author adamCategories Baltimore, Off TopicTags 19th Century, 19th Century Romanian Wagon, 19th century wagon, 4 wheels, antiques, auto journalist, baltimore, blogger, cabinets, cars, counter-tops, cutting edge technology, deconstruct, deconstruct buildings, doorknob, downtown baltimore, farmers, flickr, flickr photo set, furniture, handle, maintaining, mirrors, modern society, money, non profit, old houses, Reclaim, renew, Retrain, romania, romanian model, Romanian Wagon, second chance, sinks, soapdish, soil, statues, toilets, transportation, valuable resources, value, vanities, wagon, wagons, warehouse, washing, wooden wagon1 Comment on 19th Century Romanian Wagon For Sale!